Anesthesiology expert Mohamed Rehman, M.D. joins Johns Hopkins All Children's Hospital as chair of the Department of Anesthesia and will also serve as professor of anesthesiology and critical care (pending academic review) with the Johns Hopkins University School of Medicine. Nationally recognized for his medical and clinical informatics expertise, Dr. Rehman is also establishing the Perioperative Health Informatics Unit within the hospital’s Health Informatics Core, which uses electronic health data to improve care and increase understanding of children's illnesses, while lowering the cost of care. “Dr. 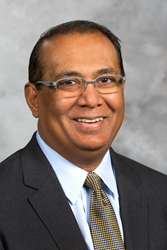 Rehman’s expertise will help innovate our anesthesia program and perioperative care by the use of data analytics for real time assessment of patients in the operating room – anticipating problems before they happen via trends,” says Jonathan Ellen, M.D., president and vice dean of Johns Hopkins All Children’s Hospital. Previously Dr. Rehman was a professor of clinical anesthesiology and critical care and professor of pediatrics at the University Of Pennsylvania School Of Medicine. He held numerous leadership roles at the Children’s Hospital of Philadelphia (CHOP), including director of transplant anesthesia, and was the anesthesia team leader for the world’s first bilateral hand transplant and several conjoint twin separations. He also developed the first biomedical informatics program within a pediatric anesthesia and critical care program while at CHOP, where he was the first endowed chair in biomedical informatics and entrepreneurial sciences. Dr. Rehman is the author of more than 50 original research publications and review articles and more than 70 scientific abstracts. At the national level, he currently chairs the Biomedical Informatics and Technology Group of the Society for Pediatric Anesthesia and is a past president of the Society for Technology in Anesthesia.